So, do you slavishly follow the recipe, the first time, at least? I don't know whether to say "yeah, me too!" or "yeah, me neither!" Mom taught me to follow the recipe as written (the first time at least), and often I do. But when I look at lots of different recipes for the same thing, sometimes I cobble them together into a sort of mix-and-match roulette. Franken-recipes! 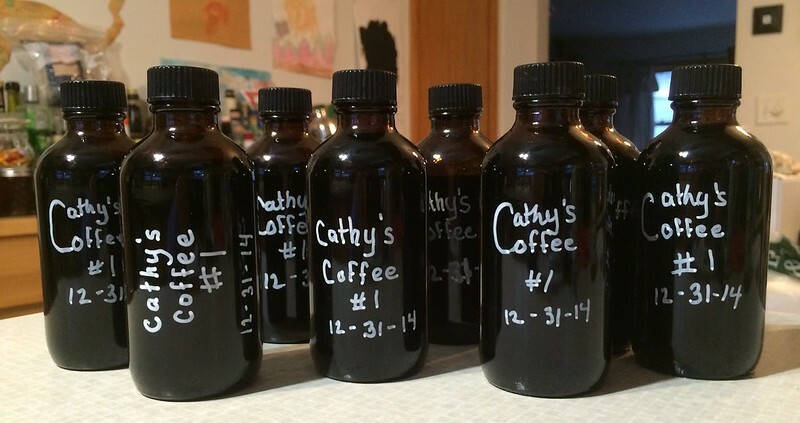 That's what I did when I decided to try my hand at making my own Kahlúa-type coffee liqueur. Did I want to cold-brew in alcohol (nice and smooth!)? Or use regularly-brewed coffee? (the traditional way!) Howabout some cinnamon and star anise, vanilla, or turbinado-simple-syrup? Hmmm. I don't like cinnamon in coffee, and star anise sounds off-putting, and I don't have any on hand. But turbinado goes nicely in coffee, and while I don't generally like flavored coffees, vanilla sounded good. 1/2 pound fresh coffee beans <--this makes it stronger than Kahlúa. Vary according to taste. Start with fresh beans, and either grind them yourself, or have them ground for you on the day you plan to make the coffee liqueur. I used a fairly coarse grind, like what you'd use for a French press. A coarse grounds should be easier to filter out later. For what it's worth, I used a manual grinder to grind 1/2 pound of coffee, and it was a total slog. If you've got an electric grinder, use it. Place the grounds in a 2-liter or 1/2 gallon jar. If using a vanilla bean, split it length-wise, and dump it in with the grounds, along with any of the tiny loose seeds. Add the rum, stir, and put the lid on the jar. Let it sit for 12 or so hours, stirring occasionally. You may weigh the grounds down if you'd like. They'll float at first - just give it a gentle stir every so often. Eventually they'll get booze-logged and sink. After the coffee has infused for 12 hours or overnight, strain the grounds out of the rum. This is messy work, so work over a tray, or in your sink, or something along those lines to avoid a mess. There are lots of ways to get the grounds out, but here's what I did: I triple-strained the grounds. But, really, you should quadruple-strain it. That may sound like more of a hassle, but really, it won't be. I jumped to an overly-fine sieve too soon. Filters clog, so using progressively finer filters saves you some frustration. Strain 1: First, pour the brew through a large, not-particularly-fine-steel mesh strainer into a bowl, then gently press the grounds to extract as much fluid from them as you can. Reserve the vanilla bean, and compost what remains (the grounds, not the fluid). Strain 2: Pour the liqueur though a finer mesh metal strainer. Something like what you'd find in a tea ball or a fine mesh spoon. I didn't actually do this step, but I wish I had. Strain 3: Pour the coffee through a really, really, really fine metal coffee strainer. I used the one that came with my Sowdon Softbrew coffee pot. It's made from an extra-fine metal sheet, with laser-etched holes ... which promptly clogged, so I had to slowly rotate the filter, letting the rum drain through a cleaner area. Strain 4: Pour the coffee through a regular paper coffee filter or a re-usable fabric filter. If you don't remove as much particulate matter as possible before this step, the paper filter will clog up reeeeeally fast, and it will be an exercise in frustration, and you'll end up discarding many paper filters (and wasting a lot of expensive rum). 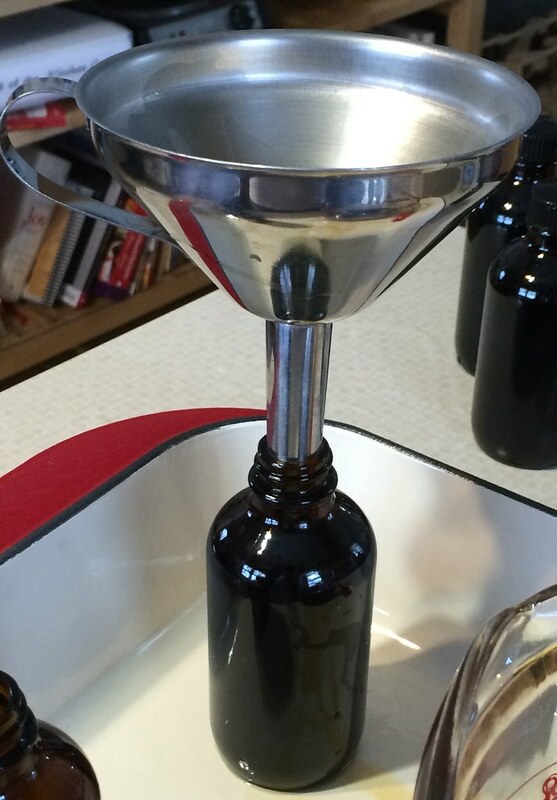 Make the simple syrup as the final filtering is happening (you'll fill the filter and do other things until it's ready to be topped off ... again .... and again ....and again). Place the sugar, reserved vanilla bean and water in a pan, and cook over medium-low heat until the sugar is dissolved. Let it cool to room temperature. Just before you add the room-temperature simple syrup to the coffee, remove the vanilla bean, and add vanilla extract if using. Add half the simple syrup to the liqueur, and taste to see how you like it - but I didn't think it was sweet enough, and used all of it. Make and add more syrup, if desired. Bottle the liqueur, then let it age for a few weeks before enjoying. Notes: I started out with 1 1/3 bottles of rum - about 1000 ml. After straining out the coffee grounds, I found that I had only about 700 ml of liqueur, which means I lost about 300 ml when I discarded the grounds (After adding the simple syrup, it ended up about 1000 ml). That's about 10 bucks of rum wasted (?). Some of the recipes I read suggested using just barely enough of a neutral spirit like Everclear to make a concentrated brew, and then adding it to the rum. I think I'll try that next time. See that groove down the side of the funnel? which allowed the liqueur to drain quickly. A friend gave me a heads up - I think this liqueur is probably fairly high in caffeine. My normal coffee-brewing ratio is about 65 grams of coffee per 1 liter of water. Because cold (or room-temp) water is a less-efficient solvent than nearly boiling water, it's typical to increase the amount of coffee-to-water ratio when making a cold brew. On the other hand, alcohol is probably a more efficient solvent than water. One shot of Kahlúa has about the same amount of caffeine as 1/4 of a cup of coffee. 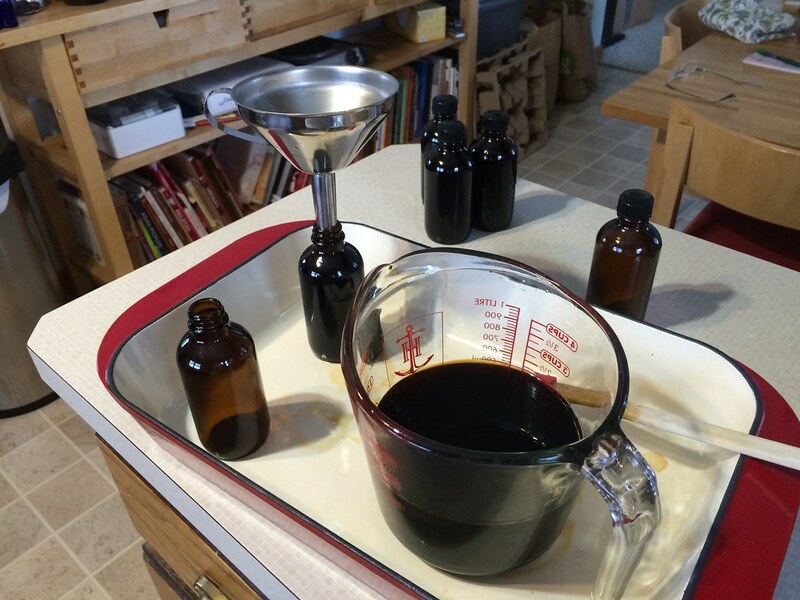 I used 227 grams of coffee grounds per 1 liter of rum. I'm guessing each shot of this is closer to one full cup. But... I'm just guessing. Either way, my friend made herself a couple of White Russians, and then couldn't sleep afterwards - buzzed on booze and caffeine at the same time. So you may want to save drinks made with it for lazy weekend afternoons. It's also wonderful on vanilla, chocolate, or (what else!) coffee ice cream. Put some ice into a tumbler, dump the vodka and liqueur in, and swirl a bit. Top with the cream. For what it's worth, this is a variation - normally you use two parts vodka, but that's too spirit-forward to suit me. Put some ice into a tumbler, dump in the liqueurs and swirl a bit. Top with the cream, and enjoy. Note: I originally wrote this back in December of 2014 in a Facebook note. I've updated it here.